The Miracle League of Manasota is an organization dedicated to providing an opportunity for all children to play baseball, regardless of their ability. 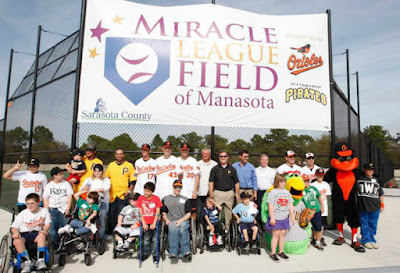 For the 14,000 school-aged children with disabilities in Sarasota and Manatee counties, the Miracle League of Manasota is providing many children the thrills of baseball regardless of their ability to play. The Miracle League of Manasota played their first game this past March at the newly built Orioles-Pirates Field at Longwood Park. Instrumental in support for this venture was BMW of Sarasota, the Pittsburgh Pirates, the Baltimore Orioles and Sarasota County. the communities of Manatee and Sarasota Counties!